Carter ‘Doc’ McCoy is a career criminal, a two-time loser who plans to make the bank heist in Beacon City his final score. Carol McCoy is Doc’s moll, as deadly as she is beautiful. Rudy ‘Piehead’ Torrento is also in on the job: a ruthless psychopath, driven only by hatred and rage. In the aftermath of the bank job, things begin to go awry, and Doc and Carol have to evade the ever-tightening net of the law. 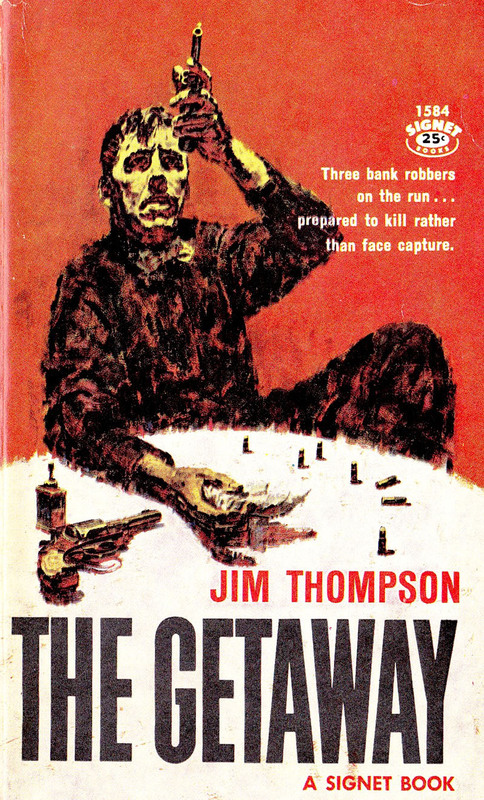 The Getaway starts out as a nice, pulpy, crime thriller. The characters are reassuringly two-dimensional and uncomplicated. Doc is a charismatic good ol’ boy from a relatively prosperous family, who turned to crime as it represented to him the most direct path to wealth. Carol was formerly a strait-laced, introverted librarian(!) before she came under Doc’s corrupting influence. Rudy is the classic noir villain: vicious, pathological, and capriciously vindictive. Rudy attempts to double-cross the McCoys; Doc McCoy shoots Rudy but fails to kill him. The McCoys have to remain one step ahead of the vengeful gangster, as well as eluding capture by the authorities. The first 100 pages or so are standard crime novel fare. Suspicion of betrayal consumes all of the principal characters; as the novel progresses, both Doc and Carol become increasingly paranoid regarding one another’s motives. And Jim Thompson, seasoned hack that he was, gives his readers some nice details in the procedure involved in fleeing a jurisdiction. For example, when hijacking a car, the escapee should always go for one with out-of-state plates - when you murder the hapless driver and discard the body, you will have a little more time before the victim is reported missing. The book features a number of such instances of casual violence (The Getaway is not nearly as explicit as The Killer Inside Me, however). At around the 100 page mark, proceedings begin to take a surreal tinge. The introduction of the quasi-mythical Ma Santis character stretches the suspension of disbelief to breaking point, and the dreamlike land of El Rey, a haven for criminals south of the border, is positively Kafkaesque. The Getaway’s mad foray into magic realism in the final 50 pages rather undermines the book’s hard-boiled verisimilitude. Buy Jim Thompson books from Amazon. Cover image from Tuneupspace blog.